Cinco de Mayo has come and gone and, thankfully, my hangover along with it. I don’t often think of heading out on a Tuesday for a raucous evening but, having seen Chef Dakota Coburn’s grand plan to roast a pig on the patio at Boulder’s famed restaurant, Centro Latin Kitchen, I couldn’t help but jump in the car despite the downright gloomy weather outdoors. Upon crossing the threshold, Centro’s buzzing atmosphere reminded me that THIS is the place to be. A group of pretty ladies in sombreros, the festive decor and a restaurant full of laughing guests simply delighted to be there. I couldn’t help but smile as I took in the place. Despite the nearly full restaurant, the sharp staff at Centro were very attentive and well organized seating and serving the guests, keeping up the momentum. I had just enough time to try the spicy jalapeño infused tequila margarita and will give it a passing grade. This is one of my favorite cocktails and this one could use a little balance – perhaps an extra squeeze of lime or dash of agave. Following that rule, of course you have to start with a shot of tequila and a Tecate, who cares if it’s Tuesday after all? As a huge fan of local microbrew culture, I had the lowest of expectations on this round. But, the ice cold Tecate and lime were so refreshing after knocking back that shot, it immediately transported me to a blistering hot summer day. I think I’ve been convinced to keep a 6-pack in the fridge for those occasions. The house margarita was fresh, balanced and complimented the food quite nicely. Ahhh, the food! It was delightful. 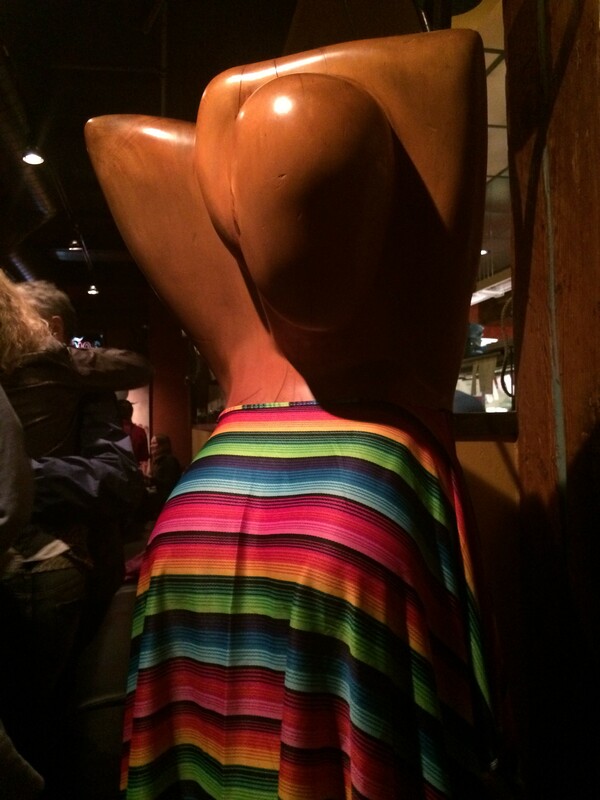 I’ll just get the superlatives out now …. fantastic, high-quality, local, fresh ingredients; succulent and expertly roasted pig with intelligent, creative and surprising menu combinations. Slow roasting a pork in La Caja China is an experts game … enter sous chef Jose (a round of applause please). Jose started prepping for this event the day before, marinating the pig in cane sugar vinegar, ancho powder and a blend of spices. Then, while the team battled the rain, Jose’s quick thinking saved the day by building an impromptu tent to protect the coals. 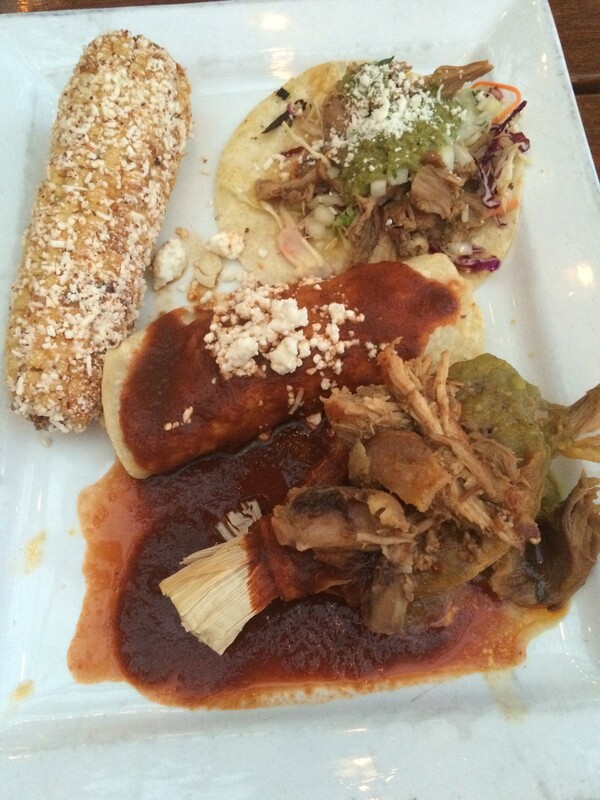 The Cinco menu consisted of Pork Tamales; Pork, Poblano and Queso Enchiladas and a Pork Taco with Spicy Tomatillo Salsa. The sides complimented the dishes, with choices of street corn, grilled asparagus, pickled ramps (wild leeks), crispy fingerling potatoes and a spicy tomatillo salsa. While everything was delicious, the street corn jumped right on top of our favorites list. Grilled corn on the cob, slathered with cotija cheese, spices and somehow cooked to perfection. It was unique and quite tasty. Green chile is one of those menu items I have to order, even if I don’t really need it. 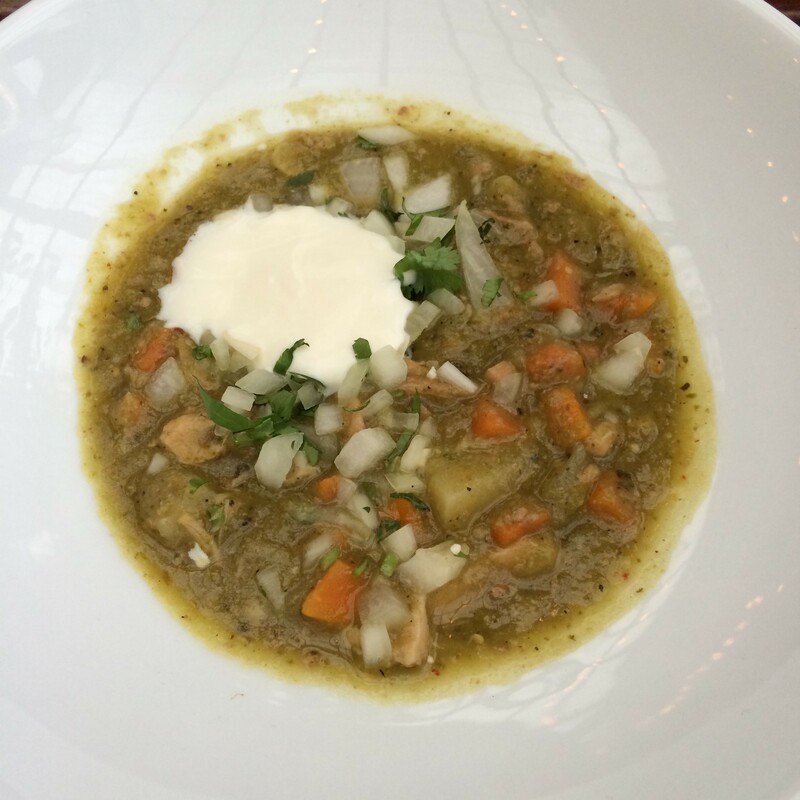 I love to experience different chef’s expressions of green chile and Chef Dakota has gotten it spot on. His version is chunky, flavorful and full of fresh veggies. It’s what I would call a high end green chile. It was spicy yet mellow with tons of flavor up front and rounded out with fresh onions, cilantro and carrots with a nice clean finish. 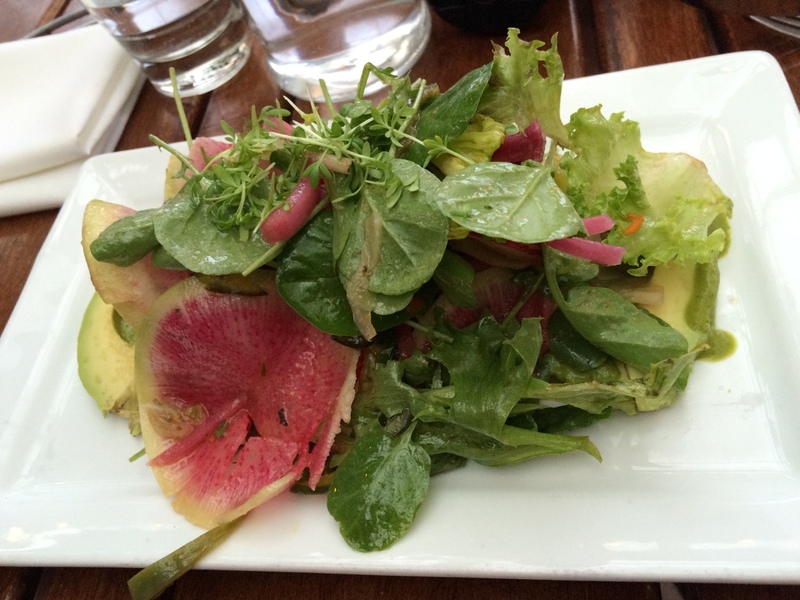 One of my favorite dishes of the evening was the avocado and radish salad. It was bright and refreshing yet, savory with a tart acidity. The watermelon radish was as beautiful as it was essential to the dish. Look for seasonal updates with local, in-season ingredients. Of the tamales, I will say that the deep, red savory sauce reminded me of sipping a classic red Margaux wine. Rich, dry, spicy and deep roasted flavors came through and that simple satisfaction of quality was unmistakeable. The dessert round also brought a few surprises. The tres leches with strawberry was well balanced. There was just enough sugar to compliment the richness of the milk and creme – plus, the little sprinkle of toffee crunch (aka rum brittle) was a delightful acoutrement of this dish. If sopapillas are your standard Latin dessert you will not be disappointed. But we did have a bit of a rave about the chaco taco – chocolate and salty peanut shell with dulce de leche. Unbelievably gluten free! And simply delightful. 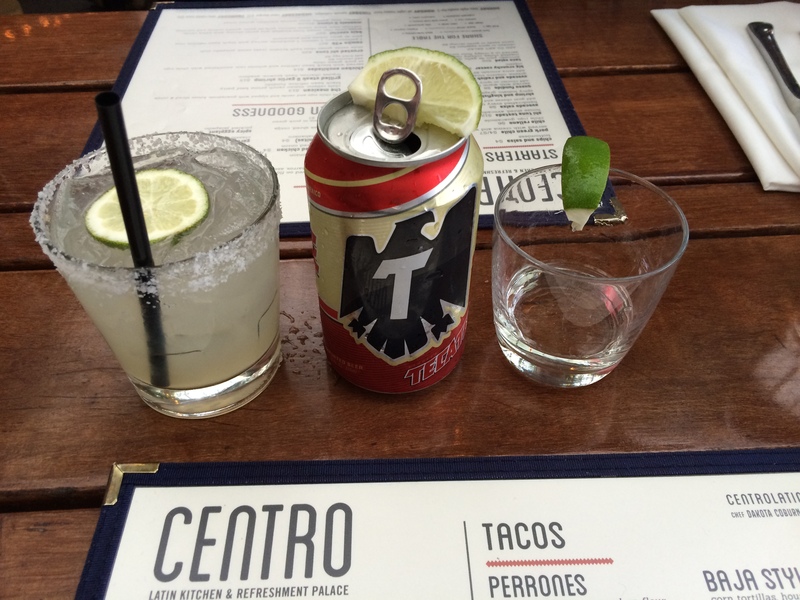 Great food and great fun is what you can expect from Centro Latin Kitchen. What started as a depressing, soggy day ended up as an inspiringly great evening. And, while you should mark your calendar for Cinco de Mayo ’16 – there’s no need to wait. 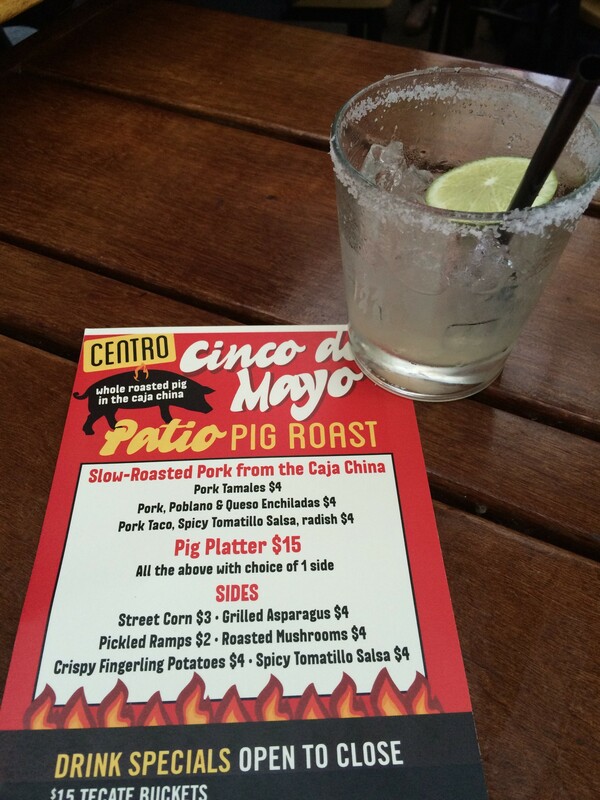 Stop by Centro for Brunch on Sunday’s or simply wander in for Happy Hour. It’s sure to be a great time.